Ending my blogging hiatus with the first sunrays engulfing Vienna I am stupefied by the perpetual barrage of bad news from all over the world while maybe residing in the eye of the European financial storm. As it turns out, Austrian banks appear to be the worst hit from the economic fallout in the young EU members east of here. Sobering up from a financial recolonization of regions that were last part of the Austrian empire that disintegrated in 1918, all major Austrian banks now have to come to terms with the new reality of pushing a cart laden with bad loans. Outstanding loans in Eastern Europe held by Austrian banks sum up to more than 70% of Austria's GDP of roughly €284 billion. For a comparison: (in German) Austria's public debt stands at a relatively moderate 58% of GDP. The average debt ratio for Eurozone members stands at 66%. This may change drastically. Austrian politicians have repeatedly said to guarantee up to €100 billion in bank obligations, but negotiations have stalled. Banks are picky about the terms for their lifelines. IMHO it will take only a few more months and capital starved credit institutions will have to accept any deal the state may offer then. Such measures are designed to balloon Austria's debt to GDP ratio to 66%, considering only a €15 billion recapitalization as the government debt committee calculated last December. It then recommended to prioritize the bailout of the banking sector. As the bailout will probably cost at least double of that, worsening the debt ratio, profligate actions by bankers may cost Austria its coveted AAA rating that helped keeping refinancing costs at the level of Eurozone benchmark Germany in the past decades. Austria had withdrawn a bond issue in 2008 as investors were asking for higher yields. 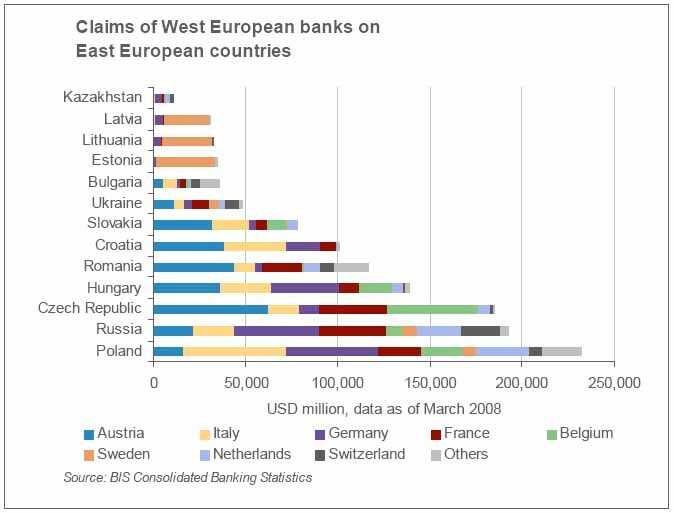 Click here for a graph depicting Austria's extraordinary exposure to Eastern Europe. Speculations gone bad are hitting home everywhere meanwhile. Local thrifts made headlines in 2008 with losses eradicating their capital base and communities face huge losses from their investments too. Add this to declining tax revenues due to a nosedive of the economy and the thin layer of prosperity disappears rapidly as my research on the ground shows. GRAPH: The Vienna Stock Exchange mirrors the change of sentiment. Leaving most other developed markets in the dust in the first seven years of this decade it has declined 75% from the top seen in 2007. Graph courtesy of Yahoo. Austria's two major listed banks, Erste Bank and Raiffeisen International have declined even more, signalling that the worst is yet to come. Austria's biggest bank, Unicredit, belongs to the Italian parent Unicredit. Austria had averted the bankruptcy of Constantia Privatbank last year. This year, it installed a state commissary at Medici Privatbank which had invested most of its funds with record Ponzi scheme master Berhard Madoff. UPDATE: Ambrose Evans-Pritchard and Bruno Waterfield describe the bigger picture of Europe's bank rescue here.